The gorgeous Zebra printed rug is a stunning way to add not only texture but also pattern to your interior. 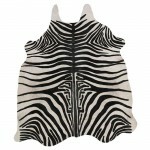 The zebra pattern is printed onto authentic cowhide. *Please be advised that due to the natural differences in hides the actual sizes and colouring may slightly vary from the images on this website.